of the police and army records. Thus UYAP establishes an electronic network covering all Courts, Offices of Public Prosecutors and Law Enforcement Offices together with the Central Organization of the Ministry of Justice. Turkey is among the twenty most populous countries of the world with its 75 million populations. The court authorities in Turkey have annual huge working load. 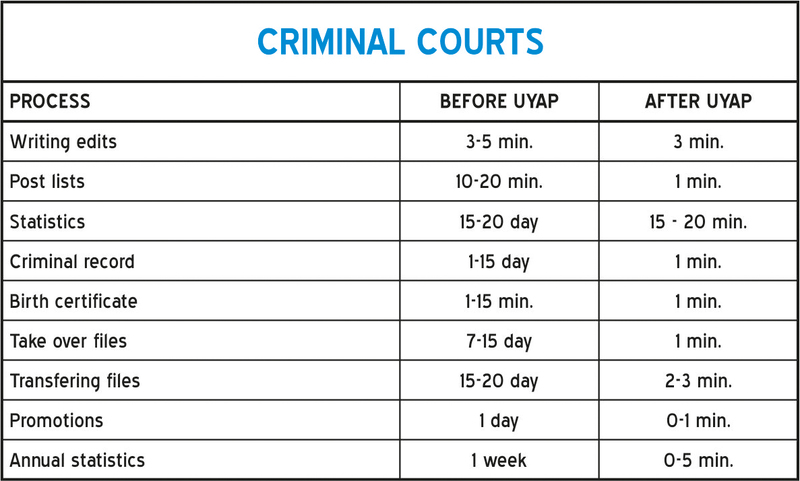 UYAP is an e-justice system as a part of the e-government, which has been developed in order to ensure fast, reliable, soundly operated and accurate judicial system. As a central network project it includes all of the courts, public prosecutors services, prisons, other judicial institutions and other government departments in Turkey. 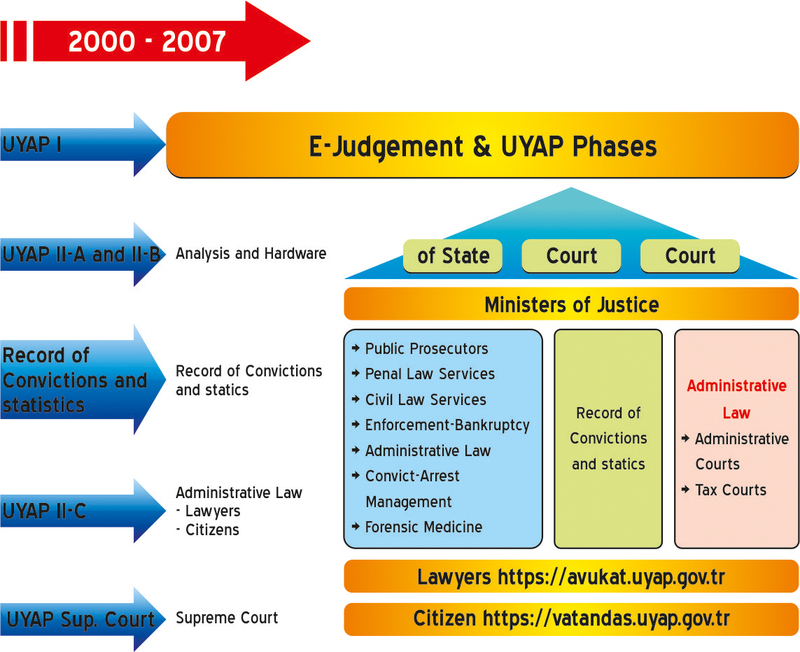 UYAP, the most outstanding information system in Turkey, was prepared and established by MoJ to improve the functioning and efficiency of the judiciary and to create an effective and less bureaucratic judicial system for each concerned institutions and citizens. The Turkish Constitution sets out in Art. 2 that the Republic of Turkey is a democratic, secular and social state governed by the rule of law. And under Art. 36, everyone has the right to a legal remedy either as plaintiff or defendant and the right to a fair trial before the courts. In view of the above provisions, it may be said that the Turkish state has a duty to establish an effective mechanism for the realization of access to justice. The employees, who work in judicial section, have being used very old technologies. Cases have being drived to long in the scales. It has being taken up long time to come to a conclusion the cases. The problems faced by the judiciary are complex, ranging from the enormous workload, inadequate training, information and monitoring. Legal procedures were complicated and disorganized. It must be carried out a reform on judicial sector in Turkey. Policies, laws, and regulations regarding ICT will be re-examined and changed if necessary, with respect to the EU acquis; eEurope+ Action Plan, initiated for the candidate countries, will be adapted to Turkey. Mechanisms that facilitate the participation of citizens to decision-making process in the public domain via using ICT will be developed. Transparency and accountability for public management will be enhanced. Good governance principles will be put in place in government services through increased usage of ICT. ICT diffusion will be promoted. Public IT projects (such as UYAP) will be coordinated, monitored, evaluated and consolidated if necessary in order to avoid duplicating or overlapping investments. Judicial and private sector will be guided according to the above-mentioned principles. The Accession Partnership with Turkey was adopted on 8 March 2001, and the Government of Turkey prepared a National Plan for the Adoption of the Acquis (NPAA) to achieve the objectives stated in the Accession Partnership. Modernisation of justice and penal reform are included as fundamental priorities in the Accession Partnership and in the NPAA. In the course of progress towards accession to the European Union and in response to the obligations of the acquis of the EU and its Member States, the Turkish government, is actively following a National Programme for the Adoption of the Acquis. However the objective of the process of law approximation is to not only implement the relevant amendments to existing legislation but as importantly, to strengthen those institutions responsible for the enforcement or implementation of the new procedures and processes. Thus UYAP establish an electronic network covering all Courts, Offices of Public Prosecutors and Law Enforcement Offices together with the Central Organization of the Ministry of Justice in order to realize these aims. Second, the countrywide organization Automation of the UYAP Provincial Units: Second phase of the project was finalized by the end of 2007. All of the judicial units and agencies make use of ICT in their daily processes. All the judiciary processes, transactions and trials transmitted to electronic environment . UYAP not only Integrated judicial institutions with each other but also with concerned institutions. So it is possible to reach every kind of information which is needed during processes. In the files criminal records have been accessed online and current. 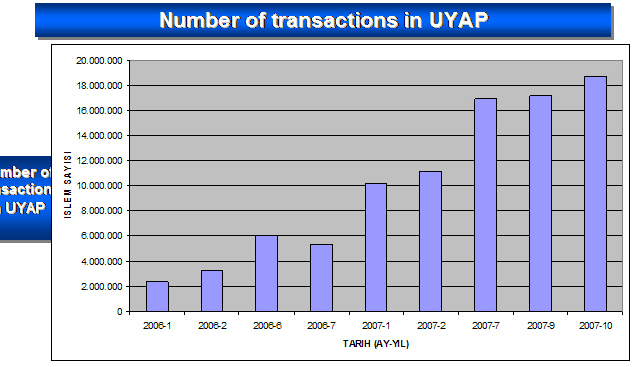 The judicial record database has been integrated with database of UYAP. The birth certificate registrations can also be accessed online and current by the courts and proceture's offices. All cases in courts can be accessible on line by judges. Land Registries and driver registers can be retrieved instantly at the beginning of the trials. Flexibility of working hours so if staff wants to work independent from locality and offices. Judges and prosecutors can access to the system from their houses by VPN. Audio and video records systems for courts will be installed and be operated on this network. Immediate procurement of necessary documents such as Criminal Record, Birth and Land Registry, etc.. during trial, evaluation of judicial statistics (for citizen, lawyers, judges etc. ), ensuring online judicial records, Criminal Records, online population records are possible. Lawyers and citizens can examine all their files, deposit their case fee, submit any document or claim and file a case to any court of Turkey through the Internet by using their e-signature. They can access and examine their case information via the Internet and learn the day fixed for the trial without going to courts. Huge workload of staff due to answering enquires of citizens in courts has been decreased significantly. According to the latest figures 63340 lawyers have been registered to the lawyer’s portal, and 10214 of them use this system effectively. The usage of lawyer and citizen portal has been growm significantly as it allows lawyers and citizen to pay court fees on line and file their suit without having to go to the court in person and pay for the fees by cash. Citizens and lawyers can access their files and accomplish every kind of judicial transaction by using internet (citizen and lawyer portal) without going courts such as litigate a claim, examine the files and deposit a case fee. The SMS judicial information system provides an outstanding service for the citizens and lawyers which enables them to receive SMS messages containing legal information such as ongoing cases, dates of court hearings, the last change in the case and suits or dept claims against them. Therefore, they can be instantly informed by SMS about any kind of legal event related to them without going to courts. A cooperation agreement has been signed with the GSM operators in order to establish this system that makes it possible to send SMS to the concerning parties’ mobile phones. This system aims to automatically inform all related parties of cases when any legal event, data or announcement (which has to be sent parties) realized by the judicial units such as courts, public prosecutor offices and enforcement offices. Sending a SMS does not replace official notification as it provides information to the parties so that they can take necessary measures in time without delay in order to prevent loss of legal rights. SMS information system was put into practice in 01.04.2008. 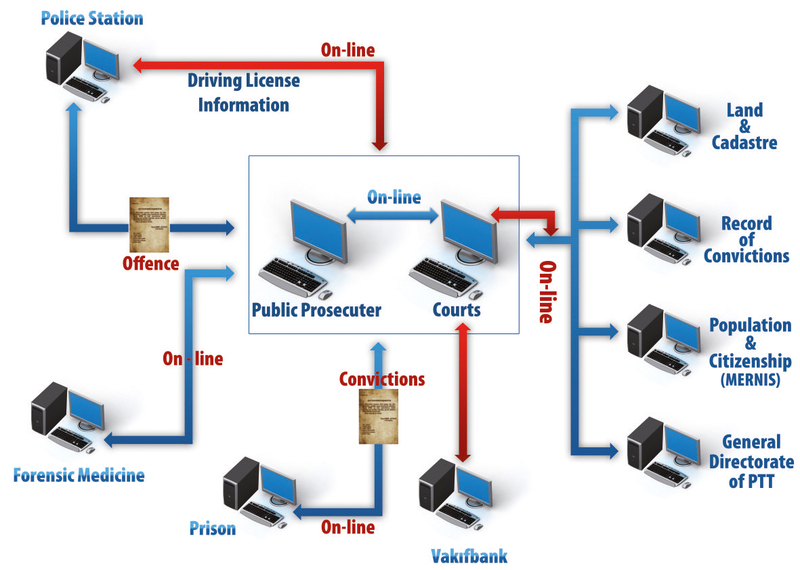 National Judicial Informatics System’s ( http://www.uyap.gov.tr/english/index.html) infrastructure is used for this system which is a nationwide central e-justice system providing fast, reliable, and paperless judicial system. Thanks to this system, as soon as judicial authorities make any legal action with their roles in National Judicial Informatics System, related parties are automatically informed by a SMS. The nationwide obligation of using citizen unique ID number in every process is one of the features making it possible to implement this system. This is not a manual working system as it works automatically with specific software that prevents additional costs. This is a server based project set up on Oracle database in Java platform. There are two types of SMS services. The first one is through basic query of the user for single use, and the second is subscription for prompt notification of every action. It is completely free to subscribe this system by sending SMS to 4060 containing citizen ID number and the phrase of “ABONE” (SUBSCRIBE). After being subscribed, in order to provide the continuity of the service and prevent unnecessary usage, citizens are charged with the only 7 SMS fare, which is less than a cost of public transportation to go courts. Lawyer can subscribe to lawyer SMS information system by writing their national ID number and “AVABONE” to text part of their mobile phones and sent to 4060. Lawyers can also determine some of the files of them and content which they want to be informed by using lawyer portal enabling them to follow only some stages of a specific case. The number of citizens using this system has reached 81.742 and nearly 500 citizens are being daily added in recent days. The number of lawyer benefiting is 1808. The total sent messages has amounted to 1006200 and daily sent SMS is nearly 1000. The number of daily SMS instead of legal summons sent by the courts or public prosecutors to the citizens is nearly 2000. In every stage of investigations, especially during the hearings, the system may suggest some proposals to the users whenever they request or may warn the users in order to prevent basic judicial errors. Notices in labels on the screen can suggest some proposals or recommend some jobs to the users whenever they want or at important situations by evaluating data files. Warnings can also be done in order to prevent basic judicial errors. Owing to this it is expected that there can be 80 % decrease in the number of cases returned from supreme Court becouse of proceeding error. For example many fugitives were caught thanks to this system. Because the system warns users by pop up on the screen if any fugutives’ data is entered to the system. Warrants about fugitives can be sent to all units of judiciary in a very short time and it became very easy to follow and apprehend them. The Document Management System (DMS): Exchange of the electronic documents between the provinces and centre has been started. At present, all kinds of data, Information, documents flow in documentation management system between MoJ and other units electronically. Announcements, circulars, opinions, resignition and employment letters of the personnel, in additional the data flow and all sorts of communications of the Legal Jurisprudence, Administrative Jurisprudence and Justice Commissions with the Ministry are realised with the UYAP. Speed and efficiency of operations: UYAP created fast, secure and efficient information system enabling the appropriate sharing of information across the wider Turkish judicial services by transfering key business processes of the judicial system into central electronic means. Instructions to other courts in order to collect evidence can be instantly sent and received on line. Access to information and make transaction online, instant and secure. All documents, processes and files are standardised: Before UYAP courts and other judicial units have being writen the writs one by one. After UYAP similar writs are being writen through stencils. That is the one of the significant impact of the case in terms of benefits and costs. So the employees save time and effort, courts and other units save personel. Due to standart and ready forms, all the data are filled automatically into the documents like instructions, indictmans, hearing minutes, decision and others so as to finish cases faster and more efficient and not to wait for days. It enabled court staff to produce common form documents without having to type each of them out one by one. It is nearly saved on labour force by 30 % In the past it took so many times to prepare all the documents during the case or hearing but now it takes only minutes and it provide us speed and reliance. Transparency in terms of accountability and data accuracy: All takeover files from previous year can be prepared within instantly. Easy and fair dispatch of the files and works of courts and enforcement units is ensured. For example, in the courts taken into operation, delivery bureaus have been taken into operation and collection of charges and duty distributions which are carried out hand by handbefore are now carried out by the system as to the objective criteria determined in an electronic environment. Economical judicial services: UYAP reduced the clerical, administrative and communications costs which would otherwise be incurred in manuel and paper- based system. With the on-line connection of courts, expenses of bureaucracy and postal costs are removed. UYAP reduces in staffing and uses the personal most effective. Ministry of Justice issues a periodical, a monthly bulletin about Turkish judicial legislation. The copies of the said bulletin amounting to 13.000 copies were being sent to all Turkish judicial units including lawyers,bar associations,etc. A recent policy change has led to a an important saving in the budget of the judiciary. Thus some 400.000.- New Turkish Liras (NTL) will be saved. Indeed, since the recent decision, bulletin concerned will be published through Ministry’s web site. Hence, MoJ will not send 12.000 copies of bulletin per post. And some 370.000.- NTL will be saved. Before UYAP could be reached to old issues of the Judicial Legislations Bulletin only per department of the Education of MoJ and that is being taken up time. After UYAP to the that issues can be accessed via MoJs web site online. And can be carried out a search and founded among the old informations or issues soonest. Obtain central financial control: The payments of the experts and taxes can be controlled in a more reliable way. Now the budget of the judicial units are prepaired by UYAP and budgetary control is made via UYAP online and momentary. Determination, audit and expenses are pursuitted on a central database with the accounting system in UYAP. Performance management through integrated management information: To provide the capability to measure performance and report on the effectiveness of Turkish judicial services in terms of such performance indicators are defined by Government and stakeholders. 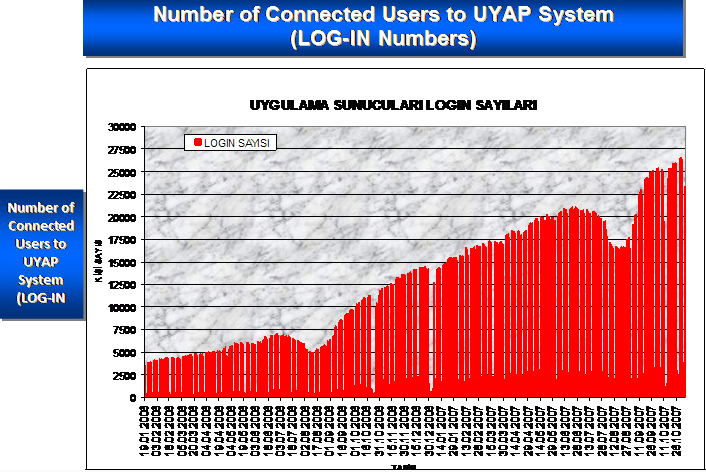 The data required for this would be captured and made available through the operational UYAP system. The performance of the personnel can be followed via the electronical environment. Data mining in judicial field: Data mining means that collection and dissemination of aggregated data for future plans. By this way it became easy to provide a research capability, to evaluate the impact of offender-crime assessment tools and programmes and to assess the effectiveness of interventions designed to reduce crimes. Evaluation of statistics (papering crime maps, data mining) will be possible. The users who have the authority to gain access to these data, can see those data simultaneously and currently and can make processes. Before UYAP promotion (being raised to a higher rank) of the employees are being notified with one by one arranged notifications. After UYAP that notifications are notified to relevant units with in a single copy which in a one list arranged. Instructions to other courts or other public offices in order to collect evidence can be instantly sent and received. Serving term of offenders can be calculated automatically by considering all related enforcement laws in detail. Miscalculations, discrepancies and waste of time are prevented. Forms and tables prepared by judicial units at the end of the day or year in order to takeover files were being lasted hours and weeks. But now, all this documents can be prepared within second and minutes in UYAP . It caused 25 % saving on working time of staff and it prevented overtime. 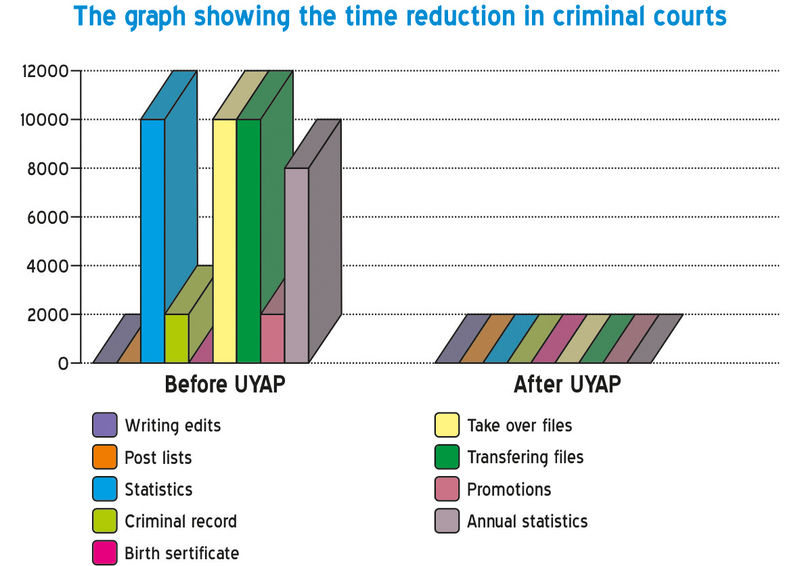 Despatch of the files and works of courts and enforcement units are being done and monitored easily and fairly by UYAP .For example, in the courts taken into operation, delivery bureaus have been taken into operation and collection of charges and duty distributions which are carried out hand by hand before are now carried out by the system as to the objective criteria determined in an electronic environment. 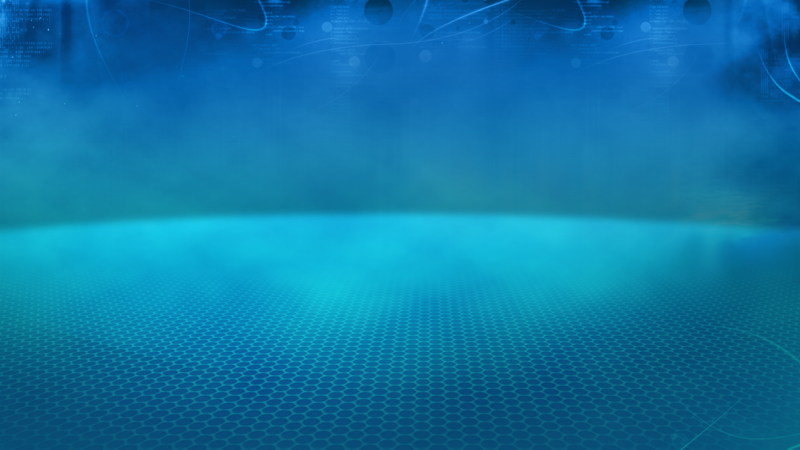 To realise all kinds of correspondence and communications within the area of informatics. Healthy and rapid transmission of data and statistical information at the Central and Provincial Organisations. Making use of the database formed by saving the produced work patterns and building verdict support systems. Reaching the legislation even during trails. Spontaneous submissions of directions and writs to relevant contacts. Surveillance of behaviour and productivity of the personnel from the Centre, Office environment without ‘paper fuss’, evaluation of statistics (papering crime maps, data mining) are possible. Managing the IS/IT function – which models to use? Flexible & re-usable IT infrastructure – what are the available IT infrastructures? The most important hinder in this way is the resistance that the users show against a new way of life. In order to break this resistance the necessary laws support should be constituted, public opinion support should be provided by making conscious campaigns. In central courts, UYAP is disseminated by a private company called HAVELSAN. But small county courts was rolled out by our experienced users chosen from central courts. They were trained in ANKARA and they work in their units in order to roll out UYAP in all dependent units. They solve the problems immediately that they encounter in the courts and give training to the other staff. Project Team who works in IT department consists of Head of department (Mr. Ali Kaya), 15 examiner judges and nearly 250 personnel (computer-engineers, electronic-engineers, help-desk and programmers.) in central unit. • The UYAP database can be connected to the databases of the other states and can form a broadened network Achieving this goal will result in secure and swift transition of international requests such as rogatory letters, extradition matters and transfer of sentenced persons. • Apart from these, UYAP case and document management system and word processor software were designed to be independently used by other judicial systems. So, it is completely possible to import these main components to other countries as they have already been transferred other related institutions in Turkey. Development and integrating “judicial records” and “judicial data”. Development, designing and implementing “judicial data mining”. Furnishing consultancy service for e-Justice information service and system.